Having dismissed complaints over the way in which the new aero regulations have impacted overtaking, insisting that it is the price to pay for faster, better looking cars, Jean Todt is today meeting with engine manufacturers to discuss the sport post-2020 when the current engine regulations come to an end. Interestingly, in addition to the current engine suppliers, a number of potential manufacturers are to attend the Paris meeting including Volkswagen, who will be represented by former Ferrari team boss Stefano Domenicali who now heads (Volkswagen Group owned) Lamborghini. In many ways this is a watershed moment for F1 as we know it, for on the one hand we have Todt, who has made no secret of his desire to see the sport build on its 2014 move to a hybrid formula, while on the other we have the sport's owners who will want whatever puts bums on seats and in front of TV screens. Having dismissed a return to the previous era of V10s and V8s, insisting that "it will not be accepted by society", Todt now has to find a way forward that will please the fans, the manufacturers, Liberty Media and society, the latter especially important when one considers the Frenchman's political aspirations. Setting out his stall ahead of today's meeting, a week after Ross Brawn warned that Liberty will steadfastly fight its corner in order to get the F1 that will best please fans, broadcasters and sponsors, Todt claimed that the sport has to be simplified. "If you take me through an F1 car, I think the cars are too sophisticated, probably too high-technology, which is not needed for the sport," he said, according to Motorsport.com. "It's a very sensitive point because on one side motoring is evolving and it would be very difficult to say the pinnacle of motorsport is not following the evolution of motoring. "I am not thinking of having an autonomous car or connected cars in Formula 1," he continued, "but that's what the world is facing and what manufacturers are facing with electronics on the car and powertrains, which are completely different. So we have to see how we can translate that into motorsport, and of course include that in Formula 1. "Nevertheless, I feel it is too expensive, too complicated, and in a way too reliable," he insisted. "I am shocked when I see the first day of testing in Barcelona. I remember in my time when we were able to do five laps it was: 'Fantastic, we did five laps.' I saw cars (in testing) were doing 70 or 80 laps. They have been building laboratories in the factories where nobody has access." In a move that would certainly put him on course for a clash with Liberty, the Frenchman admitted that he is not entirely ruling out taking the sport further down 'Electric Avenue' though he totally dismisses a return to the pre-hybrid engine formula. "The big limitation of electric cars is autonomy and time of recharging," he said. "The best car, whatever is said on the marketing side, the best autonomy is about 200km with a recharging time between six to eight hours. So I see a very good future for electric cars in cities, which incidentally is why we want to promote one electric championship car, single seater, in the cities. "A lot of cars are still diesel, a lot of cars are hybrid, downsized engines with turbo and energy recovery, and I see a lot of future with fuel cells. Probably fuel cells are completely different technology where a lot of cars are quite well advanced between 600-1000km and a recharging time of about three minutes. "We are considering introducing (fuel cells) in some category of motor sport in the future," he admits. "But if we speak about F1, F1 will still be run with the more conventional engine. That does not mean we are intending to go back to what we were running ten years ago. That will never happen." Where is the missing speed? "Todt, Simplify F1.....Simple, resign...then get rid of these horrible engines and bring back race cars not endurance cars." "One of F1's greatest mistakes was the current engine "formula." It is too complex and too expensive. 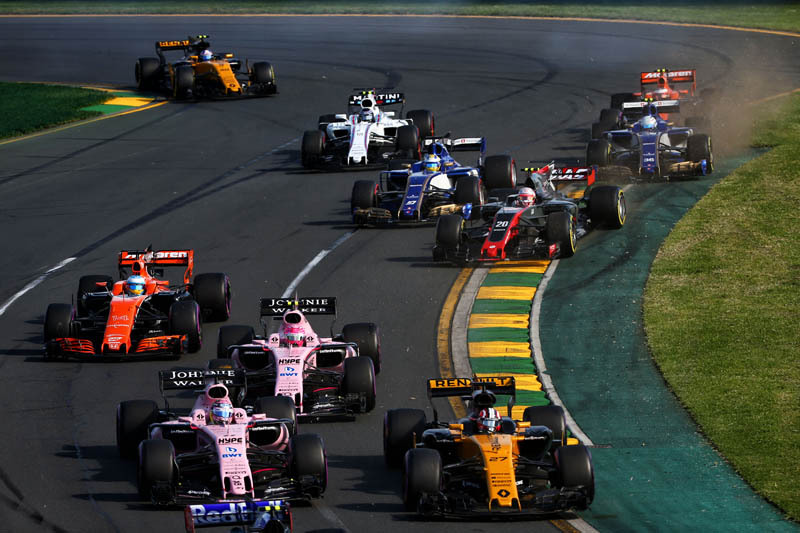 it is one thing to have manufacturers running in F1, but what the FIA did was make manufacturer participation a requirement, rather than an option. This gave huge power to the manufacturers. Bad move. Yes, please simplify. Simplify not only the engines but the whole powertrain and all the telemetry, etc. that goes with it. And please, please forget road relevance. It is a path to nowhere. Part of what attracted me to F1 years ago was the obvious LACK of road car relevance. " "Agree with edllorca. I took my sons to the last V10 race in US; sat at bottom of S curve complex at Indy; the first time the cars accelerated away my oldest son broke out in the most exuberate grin/smile of his life at the sound of the V10 powerplants doing their thing. The incredible growl - you could FEEL the power. Now if you go to a race it sounds like 8 guys who just ate Taco Bell listening to the soundtrack of Burning Saddles. Last year, and for last several years Indycars are turning faster LAPS in practice at Indy than any F1 car touches at anytime in a race. Where is the great divide that used to separate the two Formulae? Jean - go green with Formula E and go home. Don't tell me we'll never be graced with a V10 or V12 again." "I hope he is wrong. It may be time for F1 to part with 'road relevance' and any other responsibility that others have heaped on it. Time to return to being a sport at the pinnacle of performance (not necessarily of complexity) for sport and entertainment purposes. Look at other sports, where is the real world relevance of the javelin throw, a gold club, rugby? Like those sports there is no reason why F1 cannot use screaming v10s 12s with simplistic (aerowise) chassis that can be brutally quick when dominated by that special hand (think Senna dry or wet) but a handful to lesser mortals. No more telemetry! No more 80 engineer teams hidden in the paddock! No more drivers aids. No more conserving, whether it be fuel or tires or driver strength this is racing after all. Speed is good period!"